Decreasing water quality on account of dumping toxic industrial and household wastes is resulting in growing demand for water purifier in Africa. Water purifier market in Africa is witnessing entry of new players due to introduction of advance water purification technology and growing awareness amongst users. Water purifiers based on various technologies are available in the African market. South Africa and Nigeria have acquired majority of the pie in the Africa POU water purifier market share. Further, awareness towards water purification and growing residential use have spur the market growth. Growing demand for hybrid purification techniques are comparatively high in these regions. Some of the key players in Africa water purifier market include KENT RO Systems Limited, SAR Group, Eureka Forbes, H2O International, Rico, Midea Group, Aquamat SA, E-Rotek Water Systems, Hindustan Unilever, and Veolia Water Technologies. The Africa POU water purifier market report thoroughly covers Africa POU water purifier market by technology, distribution channels and end users. 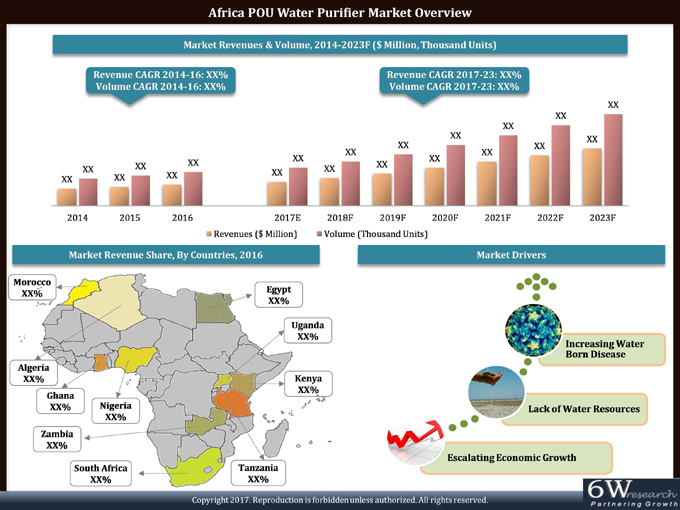 The Africa POU water purifier market outlook report provides an unbiased and detailed analysis of the Africa POU water purifier market trends, opportunities, high growth areas, market drivers which would help the stakeholders to device and align their market strategies according to the current and future market dynamics. •	Historical Data of Africa POU Water Purifier Market Revenues and Volume for the Period 2014-2016. •	Historical Data of Africa POU Water Purifier Market Revenues and Volume By Country for the Period 2014-2016. •	Market Size & Forecast of Africa POU Water Purifier Market Revenues and Volume By Country until 2023. Channels for the Period, 2014-2016. •	Africa POU Water Purifier Market Trends and Developments. •	Africa POU Water Purifier Market Overview on Competitive Landscape.